This week, we heard from a user whose MP’s agent had threatened to take him to court if he shared an image, showing TheyWorkForYou data, on social media. Here’s what we think of that. Prior to an election, you’ll see all sorts of messaging trying to turn you towards, or against, specific candidates — some from political parties, some from independent campaigning groups, and some just from individuals who feel strongly. At mySociety, we’re non-partisan: we strive for neutrality in our websites and services, and they are available to everyone, no matter which part of the political spectrum you are on. We won’t tell you how to vote; we will, however, present the facts and give you the tools that allow you to make up your own mind. We have no problem with our data being shared in this way, so long as the wording is unchanged, and the source is credited (as clearly it hasn’t been in our latter example). Adding the source benefits everyone, because while top-line statements like these are, of necessity, brief in a shareable image, they are backed up on TheyWorkForYou with links to the actual votes that substantiate them. As we say, this data is available to anyone, and TheyWorkForYou covers every MP, so there’s no unfair political advantage being gained here. The votes are statements of fact; and indeed there may well be people looking at a list like that and finding that, actually, they quite agree with everything on the list, in which case the image would be having the opposite effect from that intended. If you read our blog post from yesterday, you’ll know that we’ve recently introduced Facebook and Twitter share buttons to make it super-easy to share any MP’s votes. So, in short: share our stuff. That’s part of what it’s for. And yet, the user we mentioned had been told by someone working on behalf of the MP’s campaign that he would be ‘taken to court’ if he shared such an image, as it was ‘based on unreliable data’. All of our voting analyses are based on the official data put out by Parliament, and we do our utmost to ensure that they are fair: while much of TheyWorkForYou’s content is published out via automated processes, we recognise that voting data is too subtle and sensitive to manage in any way other than manually. That’s why all our voting information is painstakingly compiled by hand, in a process we’ve described previously in this post. MPs do occasionally contact us to question the wording of certain voting topics, and we are always happy to explain how we arrived at them, and improve them if we agree that the votes have been misrepresented. We would be quite happy to hear directly from the MP in question and to discuss any information which they perceive as inaccurate: we note that their voting page has been in place on TheyWorkForYou since August 2015 (it has been viewed by over 5,500 people, 67 of them from within the Houses of Parliament) and in that time we have not been contacted with any query. TheyWorkForYou makes politics accessible for everyone. Your donations help us. Would you say you’re pretty clued up about the political system in the UK? If you’re reading this blog, it’s fair to assume that you know a bit more about politics than the average bear. But that’s not true of everyone who uses our sites, and that’s why we’ve put out a Beginners’ Guide to the General Election. It’s in three short parts — each takes only 5 minutes or so to read — and they cover the background and timetable of the Election; how to make an informed vote; and finally the logistics of actually casting your ballot. There’s also a summary countdown so you can make sure you’ve done everything you need to. Think this is a bit simplistic? Through the emails we receive via User Support, we have a really immediate insight into the common questions, worries and misconceptions around UK politics. Some of them are complex and esoteric. Others make us realise that if we haven’t set out the basics, we’re failing in our aim of making democracy easier for everyone to understand. 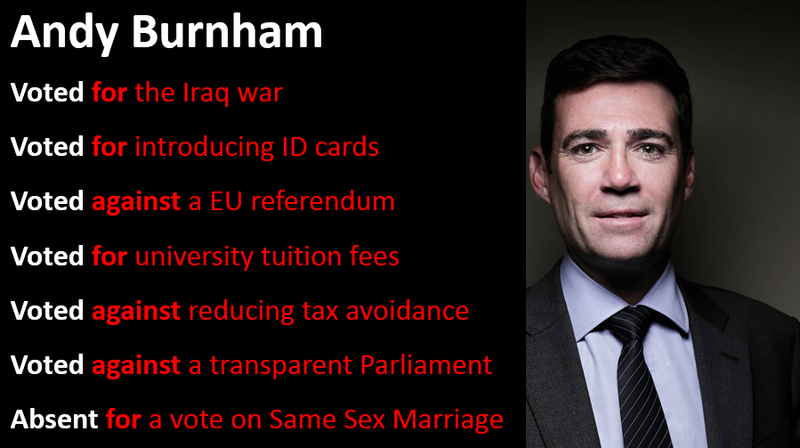 Do we vote twice, once for Corbyn/May and once for our local MP? You don’t have to join a party to vote for it, do you? Can I vote in my neighbouring constituency to help my chosen party win, if they’re a dead cert in my own constituency? These were the real spur towards writing a simple explainer. If you come across friends, family or workmates who have similar queries, we hope you’ll find it useful to share our beginners’ guide. We work to make democracy easier for everyone to understand — and your contributions help us carry on doing so. It’s official, there’s going to be a General Election in the UK on June 8th. As you might suspect mySociety has lots of tools and services that you might find useful during the campaign whether you just want to find out the voting record of your current MP or if you’re planning on building a website or app to cover the campaign. First things first: TheyWorkForYou.com already covers in lots of detail who your MPs are and how they voted. This should be your first port of call so that you can evaluate your incumbent MP, especially when you’re thinking about who to vote for next. Over the next couple of weeks we are going to make some changes here and there to make relevant parts of the voting record more prominent, and more clearly explain how we calculate the voting records themselves. Tomorrow we’ll share a blog post explaining in a little more technical detail how to access the API and some advice on how to get the most out of the service. Building a service or website that covers all or part of the country and want an easy way to let your users identify which constituency they are in? Then MapIt is your friend. It already powers most of our own services and is widely used by the likes of Government Digital Services and our friends at Democracy Club. We had planned to make some updates and amends to the YourNextRepresentative service that supports Democracy Club’s WhoCanIVotefor.co.uk site in the quiet period between major elections, ahem, but with the snap election called we’ll be doing what we can to make the site run faster and make whatever UI tweaks and fixes we can in the time available. It’s not too late to let your current MP know what you think on any subject of your choice via WriteToThem.com. So, the results are in. Some of us have a brand new MP. Others will see the same familiar face returning to the benches of Westminster. 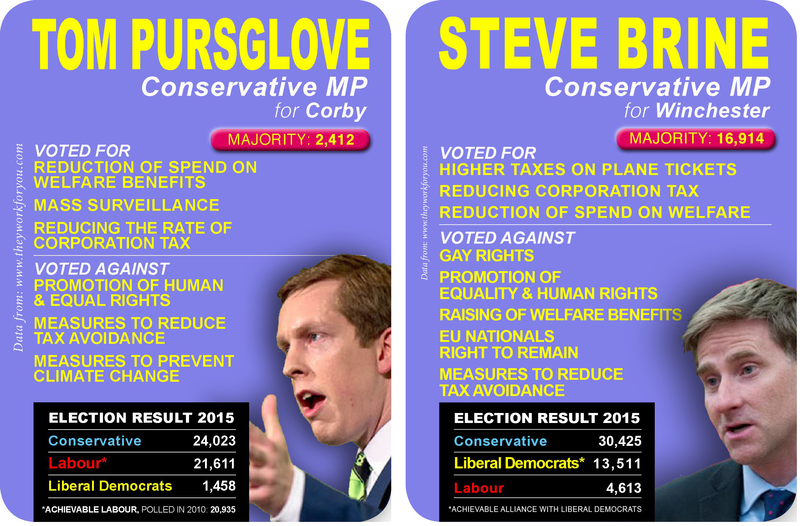 What will your MP do in Parliament? Will they speak about the things that matter to you? How will they vote in your name? TheyWorkForYou.com makes it very easy to keep check: you can even sign up to receive an email whenever your MP speaks. These are in the form of a daily digest, and we only send them on days when your MP has actually contributed to a debate. It’s the low-effort way to see exactly what your MP is getting up to, with no spin, just the facts. Click here for our easy sign-up. If you already receive alerts, but your prior MP has lost their seat, be sure to set up an alert for the new one now. We’ll be sending reminders to all current subscribers. There’s no need to cancel the previous alert, however: if your old MP isn’t in Parliament, we simply won’t be sending any more emails about them. Spare a thought for us over the night of May 7th – for, when the nation wakes up to the General Election results, we’ll have been up all night updating TheyWorkForYou. As you might imagine, elections are bitter-sweet times for us here at mySociety. On the one hand, swingometers, marginals and ballot boxes are about as exciting as life gets for a bunch of political geeks. On the other, we have only a short window of time in which to ensure our parliamentary websites reflect the new administration. In previous years, this has meant manually updating an XML file and running an import script 650 times – slightly arduous, even for the most dedicated civic coder. This year, we’re taking advantage of the fact that YourNextMP exists and several of us will be staying up anyway to see the results, and hoping to do things a little differently. As each result is announced (or potentially even earlier, if it’s clear that there’s only one possible winner), site administrators will be logged in to YourNextMP, where they’ll have access to a “this person won!” button. We’ll be on a rota throughout the night, sharing duties with the equally dedicated Democracy Club volunteer team. When that button is clicked, YourNextMP will update, and TheyWorkForYou will notice and automatically update its underlying JSON data. 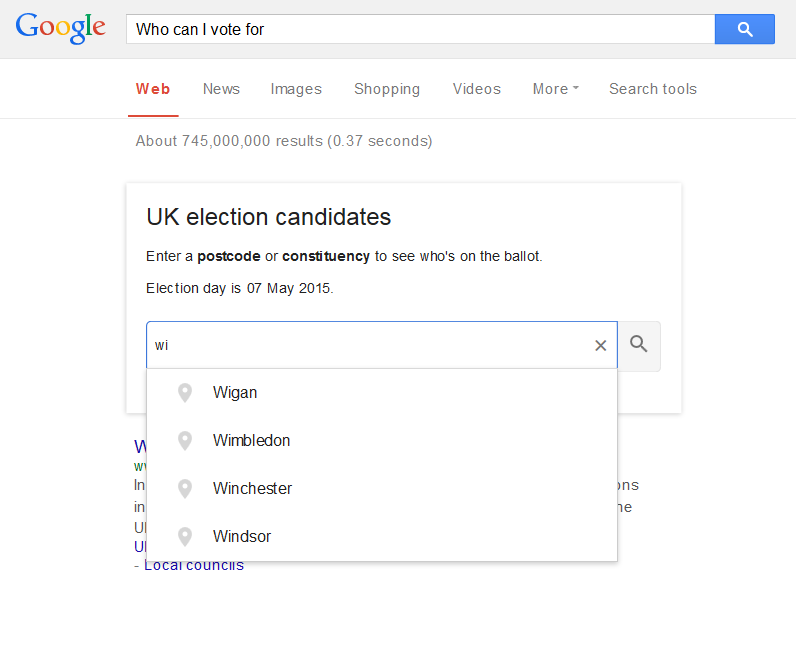 This is the data we match you with when you input your postcode on the homepage, meaning that TheyWorkForYou should be a great place to find out who your next MP is as soon as you wake up (assuming the results are in) on 8th May. UPDATE: If you are interested in the technical aspects of the YourNextMP and TheyWorkForYou updates, you may like to read more about it in this thread. Note that new MPs will not have a great deal on their pages yet: TheyWorkForYou’s MP pages are built up of voting and debating activity, past positions and expenses, etc, and of course, totally new MPs will have none of that. But there’s one important feature that you should take advantage of on Friday—the ‘subscribe’ button. Sign up, and we’ll send you an email every time your new MP speaks in Parliament, so you can keep track of exactly what he or she is saying in your name. If you were previously following an MP who has resigned or lost their seat, don’t forget to follow the new one! We’ll be sending out a message straight after the election to remind you. Another website which will require a lot of attention post-election is WriteToThem, which matches you with your local and national politicians so that you can contact them. Unfortunately, WriteToThem takes a little longer to update, as we rely on data, including email addresses, from external sources. We’ll be updating as soon as we can. Meanwhile, if you have an urgent message for your MP or councillors, you may find that you can locate direct email addresses on the official Parliament and council websites. Have you ever typed a phrase like ‘what’s the time in New York’ or ‘what is 28 km in miles’ into Google? If you’ve done so in the last couple of years, you’ll have seen answers given on the results page itself, inside dedicated answer boxes. 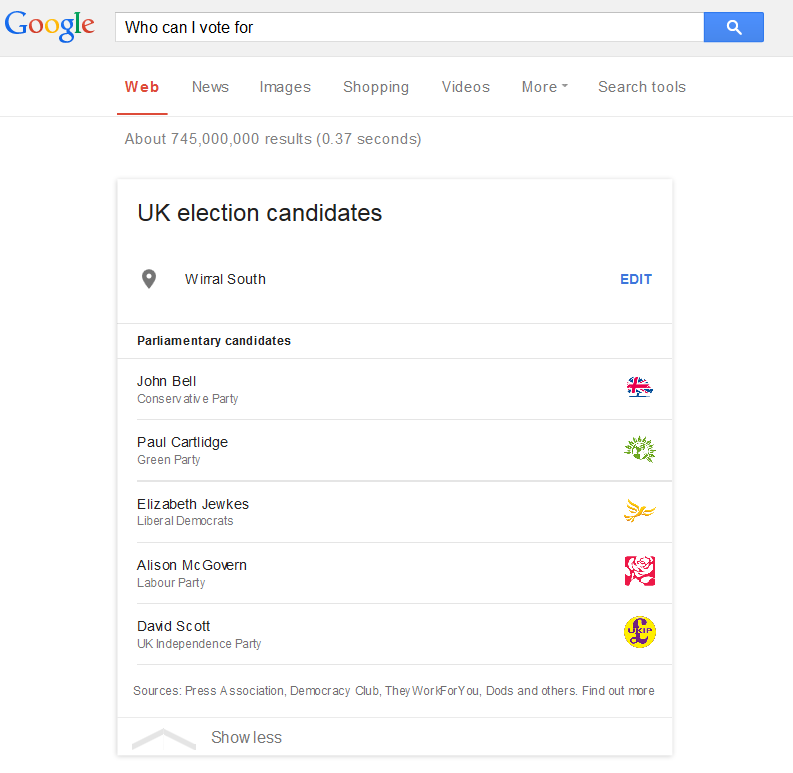 For the next couple of weeks, Google users in Britain who search for key election data will see the answers presented in-page in this increasingly familiar way. We’re delighted to share the news that these answers are being supplied as open standard data from Democracy Club’s brilliant, volunteer-powered YourNextMP project, as well as our own long running TheyWorkForYou. The aim is to make information easily accessible to anyone who seeks it: we are one of a few data sources to be supplying Google. We’re particularly excited about this because YourNextMP is powered by PopIt, a Poplus Component which is used to create nice clean open standards Popolo data on politicians. We think that adoption of open standards data by companies as big as Google points towards a promising world in which there is a lot more good quality, open standard data on political issues of all kinds. 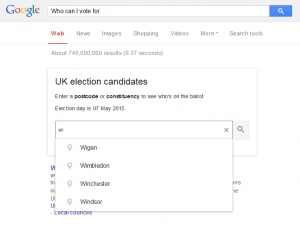 Try it for yourself: search for uk election candidates or a question like who can I vote for? We’re so delighted to see essential civic data being brought to the search engine’s vast numbers of users. It’s all down to the power of open standards and re-usable open source software. YourNextMP provides feeds via an API, which are available for anyone—large organisations like Google, or individual people like you, perhaps—to use in their own projects. YourNextMP’s use of the Popolo open standard for government means that the data is clean, machine-readable and easy to slot in anywhere—including Google. Google.org, whose funding allowed the creation of Poplus in the first place. Just as was hoped, YourNextMP data has been used to underpin a variety of projects by many individuals and organisations. 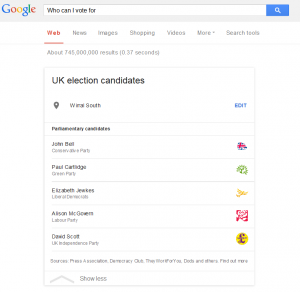 Google may be the latest and the biggest, but we’re no less pleased to see how it has made possible numerous tools to educate or inform the public before the election, as well as powering stories and infographics in several national newspapers. See our previous post for more details on this. And there’s more. YourNextMP, because it’s built on Open Source code, won’t be going into hibernation until the next election in this country. 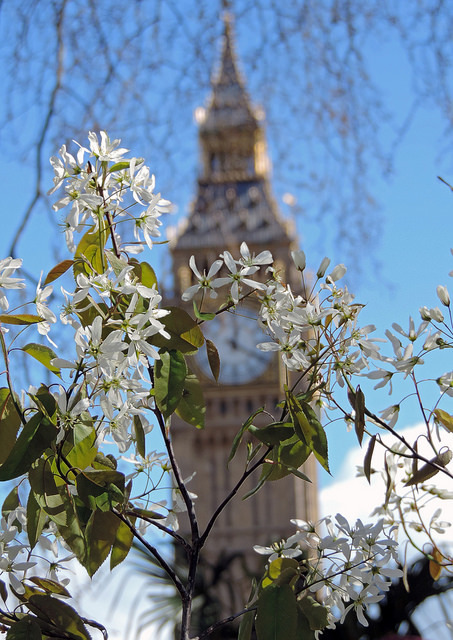 The UK voting may be over on May 8, but there are elections all over the world still to come. Our friends in Latin America will be taking the code and adapting it for use in Argentina whose election process starts in August. ¡Viva YourNextMP! Have you seen YourNextMP lately? Comments Off on Have you seen YourNextMP lately? Back in December, we told you about a project to collect the details of every election candidate in the UK— YourNextMP.com. YourNextMP isn’t a mySociety project. It falls under the wide umbrella of Democracy Club, a loose confederation of volunteers doing interesting digital things, with the overarching aim of helping people be more informed before the election. We have, however, been lending our technical skills. That database now contains details of every candidate and we’re really glad to see that many projects have been built on the back of it, from national newspaper visualisations to voter advice applications to single-issue sites and more. Back in December, YourNextMP was a tool for crowd-sourced data-gathering. As well as providing free, open source data via its API, it has now matured into a useful static site in its own right. In a neat virtuous circle, it not only shows you who your candidates are, but also displays feeds from many of the sites using its own data. News stories which mention your constituency or candidates — from electionmentions.com. In many cases, these sites are just like YourNextMP: they’re relying on the time and energy of people like you, to add information. They’ve all made it as easy as possible though, so whether you fancy snapping an election leaflet on your phone and uploading it, or asking your candidates to provide a CV, it really does only take a couple of minutes. You can also still continue to add more data (such as email addresses) to the candidates on YourNextMP, if you have time to contribute, and some basic Googling skills. A whole lot of facts are going to be bandied about by politicians, between now and the General Election. How do you know which to believe? Fortunately, there’s an organisation that’s dedicated to checking every statement, so that you can see the bare facts with no added hyperbole. Our friends at Full Fact are working day and night, scanning mainstream media outlets (radio, television, newspapers) and what is said in Parliament, logging any sightings of claims made by politicians. Their researchers then provide a professional assessment of each claim, along with a verdict on whether it can be said to be supported by the relevant data, not supported, or whether there’s not enough information to prove it either way. With a large team consisting of volunteers and experts, such a large number of facts to be checked, plus the likelihood of the same facts being used by different parties in different ways to suit their agenda, it’s essential that Full Fact have systems in place to help them keep track. That’s where mySociety Services stepped in. We’ve created tools for their volunteers to log sightings of claims and for researchers to link theses claims to the data and provide an expert assessment. That means that when the same issues keep reappearing, Full Fact will know exactly where to look to find the relevant facts. At the same time we’ve had an opportunity to standardise and improve the organisation’s coding practices, ensuring that as Full Fact grow their own development team they’re able to work without stepping on each other’s toes. Check out Full Fact’s valuable work here – and if your organisation’s workflow could also benefit from some streamlining, take a look at what we offer on the mySociety Services site. Every general election there are a load of projects that all need the same thing – a nicely formatted, accurate list of the candidates who are standing at the election. Loads of people need this data – journalists, app builders, campaigners, Wikipedians, everyone. But the government doesn’t actually publish the lists until right before the election, and when it does the data isn’t the least bit suitable for modern use (think unstructured PDFs and worse). It’s way too little and way too late. That’s why we’re big fans of the new YourNextMP.com, a collaborative project headed up by our friends at Democracy Club, and endorsed by various other organisations, including mySociety. YourNextMP.com is a totally free, open database of candidates, that is made partly from screen scraping and partly from volunteer contributions from people who think that having a single good quality list is a sane idea. It publishes the open data gathered both through a nice clean website, and through a nice modern API. Soon it’ll also provide csv export,too. And it means we can have nice shared identifiers for candidates, meaning greater potential connectivity between election-related journalism, tools, sites and projects run by different people and organisations. The builders of YourNextMP have also taken steps to ensure accuracy and deter abuse, most strikingly by forcing all new data to be sourced, and keeping nice public logs of all the changes (and who made them). To be clear, YourNextMP is not a mySociety project. We are just very happy to endorse the idea, and to supply one of our open source tools (PopIt) to help store and share the data in useful ways. Plus some of us have been chipping in in our spare time, for instance by adding data. 1) Add data! The main thing needed today, 146 days before the election, is the most basic data on who is known to be standing, today. We think that YourNextMP is probably already the most up to date candidate list out there, despite being very much unfinished. Additional data, about candidates’ Facebook pages, birth dates and so on, isn’t such a high priority right now. You can help by looking up your constituency on the site, or choosing a random constituency, and just using your best Googling/telephoning skills to find out who’s definitely standing this time. If you want to chat to other people who are doing the same thing, use the #yournextmp hashtag. We’ve put together a few tips on canny ways to find information on prospective candidates, here. Don’t feel you have to stop when you’ve filled in your own constituency – there are plenty more to complete. 2) Spread the word that a single, high quality, free and shared database of candidates is just A Good Thing that people should support. Who loves time-wasting? Nobody! What is YourNextMP if not an anti time-wasting project? Nothing! So, please, if you’re planning an election-related project, tell people that YourNextMP is a good idea, and consider letting them use your logo on their site, as a sign of good will. And if you see someone in your office about to pay for a proprietary database of candidates, why not suggest they give the money to YourNextMP instead?